Blastzone Mike’s Halloween Party W/Special Guest – Fifi Larue (The Gothic Killer Clown of Rock n’ Roll) And More..
As you may recall, I was fortunate enough to have been a zombie extra for the pilot episode of AMC Network’s The Walking Dead. I have wanted to tell about my experiences, because I had so much fun, but also, with the Dead Week upon us (defined as the celebration of Issue #100 of the comic book, plus the coming of San Diego Comic-Con). So here, in three parts, is my Diary of a Zombie: My Experiences as a Zombie on the Set of The Walking Dead. The first thing I learned was BE VERY EARLY. I had a 7AM call time the first day, and I made sure I was there five minutes early. I had gotten up around 5AM, showered and shaved, and found a diner about a half-block from my hotel. Luck shone upon me – the food was excellent and the service was quick. The staging area was an abandoned downtown restaurant and watering hole. From the strategically positioned location, two fancy bars, and a mezzanine – I figured this place must have been “The” establishment for the rich and powerful. The location also is a metaphor of sorts. Death, after all, is the central theme, and this restaurant was now… dead. I walked inside and walked up a set of marble steps to the foyer. I was motioned to a table and checked in. I was given some paperwork which, I was told, was essential to get paid. Get paid? I thought. I never thought about that! I would gladly pay them to be there! I first met Patrick, who had called me with the good news about my casting. He instructed me to go up the main staircase to the mezzanine area, which was the holding pen for all the extras. I had read both the email and the casting company’s Facebook site regarding first-time extras. So I had packed a small canvas bag with what I thought I needed: A book, a change of clothes, a snack, and of course I brought my Vol. 1 trade paperback of The Walking Dead. I wanted to compare the book with what I was going to experience. I took the staircase and saw about sixty or seventy people, all sitting around huge tables, reading, sleeping, listening to music, or just otherwise keeping occupied. I realized then that I did not know a single soul – plus, I had to keep my eyes open for my patron, a member of the crew who I had never met. After about twenty minutes, I saw my contact, who called over a PA, or Production Assistant. He was young, tall, muscular, and African-American, with long dreads. His name was Dorado, and he was from New Orleans. I sat down near a cluster of guys who were talking. One of them was a Brit with long red hair. I knew that the comic’s artist, Charlie Adlard, was British, but could this be my good fortune to be sitting near the artist for the Walking Dead? He was talking to a guy in an aqua baseball cap. Suddenly, the guy in the ball cap pulled out a hardcover copy of the graphic novel. The red-headed guy promptly pulled out a Sharpie and started drawing and inscribing the book’s inside cover. Yes, it was Adlard, all right. I was ecstatic. Nerdgasm. Slowly, as the line snaked around and extras played musical chairs, I finally spoke up. The group I was sitting with was about as distinguished as you can get. Charlie Adlard. Gary Whitta, who had just scored fame with The Book of Eli, for which he wrote the story and screenplay. And a fella named Tim, who will figure much more prominently later. Gary told me of all the cool Easter Eggs in The Book of Eli, mostly centering around the poster and prop for A Boy and His Dog. The poster can be seen when Mila Kunis brings Denzel his dinner. The prop: The sniper rifle used in the street scene. In exchange, I told Gary and the group how intricately Marvel had laced clues in the Fury-Stark scene toward the end of Iron Man 2. I told them how I had actually commandeered an IMAX theatre and had used it as my personal remote and freeze-framed the screen throughout the scene. Look yourself for the illuminated spots representing Wakunda, the middle of the South Atlantic, New Mexico, Norway, Southern California, two spots in New York, and the Arctic Circle in the North Atlantic. Then notice that the North Atlantic dot starts blinking. Note the live-action shots of the Hulk rampaging on a Virginia college campus, which are the actual scenes from the Ed Norton Hulk movie, as well as the gamma-ray detector panel — all in reverse. But I digress. Everyone was duly impressed, and Whitta shook his head at the intricacy of the clues. I became an ex-officio member of the group. It took me about a half-hour in makeup. The plan was never to actually be in makeup, but to be a “background zombie” in the rear of the crowd scenes. I was perfectly fine with that! I was just happy to be there! However, my contact in the crew enabled me to get into the makeup line. This was the “hero zombie” makeup line! Hero zombies are the zombies you see in the foreground. Blood. Bites. Torn flesh. You know, the cool zombies. Just before my turn in the chair, though, another PA (production assistant) put me in the “mask” line. Time was a-wastin’, and they needed to move people into the quicker line to try and make the day’s shooting schedule. That meant I was issued a mask and had a lot of makeup applied to my eyes and other makeup sprayed on my head, neck, arms and hands. The sprayed-on makeup had to be applied outside the building. The person sprayed different color liquids on my arms and hands. By the time he was done, it appeared all the blood had pooled into my hands and fingers. The way it worked out was awesome! The mask I quickly figured out how to form a vacuum between the mask and my face, pressing out the air and creating a fit that made the mask look like it had been molded from my own face! I honestly did not mind the lack of prosthetic makeup. I was just happy to be there. It actually worked out better for me, when we took breaks in the 100-degree heat, and when we ate lunch. When I came back inside, Whitta, Adlard, and the guy in the hat were gone. Shortly afterward, we gathered up our gear and moved to another building just down the block from the outdoor set. It appeared to have been a dance studio, as full-length mirrors adorned most of the walls. I should note that pretty much the entire area looked run-down, which was a real shame. The location scouts really outdid themselves, as they have all series long. I notice an extra, a Hero Zombie. He is dressed in mechanic’s coveralls. He is reading Max Brooks’ Zombie Survival Guide. Finding his motivation. There is a lot of waiting on a movie/television production. What interested me is the way many of these veteran extras had adapted to the “hurry up and wait” realities of the industry. Many had crafted special backpacks and assorted gear. I soon developed a speaking relationship with two of the extras: Ondie Daniel and Pamela Ashe-Smith. Shortly afterward, I met another extra. Jack Byrd, whose age was closest to my own, had retired from the Georgia Department of Child Protective Services. While on the set, he pointed to the building at the corner of the street where we first chased Andrew Lincoln. “I worked there for twenty years,” Jack said. Jack and I got pretty close while working that weekend. He was a masked zombie on Saturday, like me, and we sat together frequently when not chasing Lincoln. During lunch, I told him the entire chronology of the comics, and I noted the presence on set of Greg Nicotero, the famed makeup effects maestro. “Greg Nicotero is the best in the world at what he does,” I explained. A few of the younger extras were familiar with the comics. We all had fun discussing the books, the show, and when we would see Michonne. Speaking of Michonne: One of the extras was a dead ringer for Michonne. I met her on Day Two. I tried to show Charlie Adlard, but he was elsewhere on the set. Zombie School is the usually-mandatory training academy for zombies. If you own the Walking Dead Season One Blu-Ray or DVD box set, you can run the feature. Or you can see it online. I did not attend Zombie School, but I had practiced extensively, and I had mastered several different shambles. The first day’s filming largely consisted of us chasing Andrew Lincoln (“Rick Grimes”), his riding double and stunt horse, from various camera angles and directions. Frank Darabont, the pilot episode’s director and first-season “showrunner,” sat in the “video village,” a bank of computers and monitors, grouped under a couple of tents like the ones seen when tailgating at a football game. We always knew when we had a great “take,” because we would all hear Darabont yell, “CUT!” and then laugh maniacally. We heard a lot of maniacal laughter those two days. I caught up with Whitta and Adlard on the set. Both were made up splendidly, with superb prosthetic makeup. Whitta was adorned in pajamas, bathrobe and slippers, while Adlard looked as if he had just been someone’s lunch. Charlie and I had been talking just before we were separated, and I thought I would finish the conversation. “As I was saying,” I said to Adlard, walking up to him. His eyes grew wide. “BLOODY HELL!” he exclaimed. I guess I looked great! 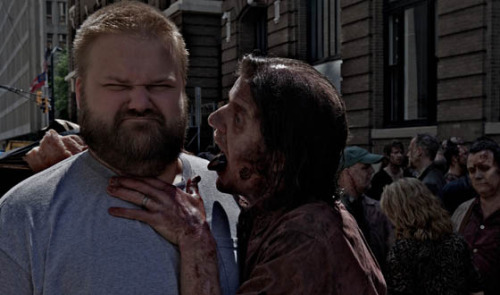 By the way, in the photo above, Charlie is attacking Robert Kirkman, undoubtedly regarding getting scripts late. In the background and to the right are Tim Daniel (with the aqua ball cap), Steve Warren, the back of Michelle Flanagan-Helmeczy’s head, and Gary Whitta (extreme right, in pajamas and robe). That night, I went back to the hotel, showered off the makeup, and hit the diner – again. I needed a good night’s sleep, because I had a 6:30 AM call time, and there was no way I was going to be late! I have wanted to tell about my experiences, because I had so much fun, but also, with the Dead Week upon us (defined as the celebration of Issue #100 of the comic book, plus the coming of San Diego Comic-Con). So here, in three parts, is my Diary of a Zombie: My Experiences as a Zombie on the Set of The Walking Dead. Parts One and Two will run Thursday, July 12th. Part three will run Friday, July 13th (get it? Friday the 13th!). To say that I am a fan of the zombie genre is to say that the Grand Canyon is a pretty rock formation. I am a massive zombie fan. As far back as I can recall, the idea of the undead walking has had a great allure to me. I never liked those early, 1940s-era zombie films, though. White Zombie and the others, with their voodoo mystique, really did not do it for me. What did do it for me was a 1950’s film, Creature With the Atom Brain. It had Richard Denning. It had a Nazi mad scientist in a cool lab. It had gangsters. It had dead cops walking! It had everything a kid with a fertile imagination would want. But, as so many others have said over the years, the reinvention of the zombie mythos, served up ghoulishly by George A. Romero, was the coup de grace. I actually saw Dawn of the Dead before I saw Night of the Living Dead. I was in Connecticut with my then-girlfriend, and Dawn had just come out. I became a Romero fan right then and there, for life. I had the great good fortune to meet Mr. Romero, back in the late 1970s, at Florida Atlantic University in Boca Raton. He was brought in to lecture and after the event was over, I introduced myself and asked him, among other things, why his protagonists were always black men. I was fascinated and impressed that Romero would cast such good young black actors in those pivotal roles. He shrugged and said, essentially, that he had no answer. I respected that, and I know his answer to that question today is much more thought-out and refined, and countless articles and blogs have been written about that question. I still like his personal response to me the best. Zombie fans will go to great lengths to find material to watch and read. We are a very forgiving lot, and we will sit through absolute drivel to try and find diamonds in the rough. And those diamonds are rare: Shock Waves, filmed around Miami with underwater Nazi zombies; the Fulci Italian zombie movies, always enjoyable; and a few others. But there have been quite a few stinkers too! My video library is stocked with zombie cinema that did not quite make the cut. I also used to collect comic books when I was a kid. I had to sell off quite a collection when my family moved in 1970. I tried to restart those collections twice in the 1980s, but it was not until I read Watchmen two years ago (in preparation for watching the movie) that I dove headfirst back into comics. And that was when I found The Walking Dead. It truly was comics love at first sight. 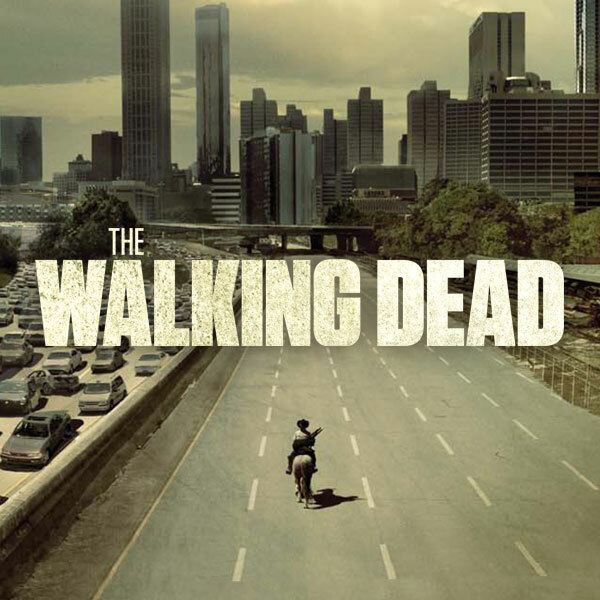 “The zombie movie that never ends,” as creator and writer Robert Kirkman calls it. I started reading where many people now begin their collections: the Walking Dead Compendium, a gargantuan, 1100-page softcover behemoth covering the first (and most pivotal) 48 issues of the comic. It was brilliant. It was a revelation. And, like all great zombie fiction (whether written or filmed), it is all about the survivors – not the zombies – that makes great zombie entertainment. And Kirkman makes us care about survivors like no other. He makes us like them, and then he kills them! Shortly afterward, I learned of the planned adaptation of the comic books to television. And so it was that, one morning in May of 2010, my deputy CIO, Lauren Perlman, came into my office at the House of Representatives. Roughly two weeks later, I got a call from Patrick of Extras Casting Atlanta, the go-to casting agency for television and film production in Georgia. Think Zombieland. The Crazies. X-Men: First Class. And The Walking Dead. Patrick called to get my email address so they could forward the information on where to report for sign-in, along with my date and “call time” when I was due on the set. My shoot was for the weekend of June 12th and 13th, 2010. That was perfect, as it did not interfere with my day job as CIO (that’s head geek) for the Florida House of Representatives. As you might imagine, Lauren is now set for life. I had never been in a movie before. My filmmaking experience was confined to watching the filming of a scene for the Chuck Norris film Invasion USA back in the 1980s. However, because of my different positions over the years in my “day jobs” within politics and government, most recently as an expert in pandemic preparedness (imagine that), I have appeared on television roughly a hundred times. I have been on NBC News, CNN, Fox News, CBS News, ABC News, and way too many local newscasts to even try to count. That gave me an appreciation for what I was about to do. So I entered the situation with a completely blank canvas upon which to paint my recollections and to learn and absorb as much as I could during the two days I was there. I decided to rent a hotel room as physically close to the shoot as possible. Even before the casting company had sent my confirming email with map, I had been able to scope out the details of the shoot on the Internet. I chose the closest hotel to the shoot itself – well, the closest hotel that was not going to cost me an arm and a leg (har!). That hotel wound up being two blocks from the set as the crow flew, but with the street closures, it still took me about 5 minutes to drive there. I arrived in Atlanta that Friday night. The drive was problematic, as I ran over a shredded recap tread going northbound on I-75, about an hour south of Atlanta. After pulling off the interstate to inspect the situation, I kept going and pulled into a Truett’s parking lot in the southern suburbs of Atlanta to eat and to make repairs. The plastic shield underneath the oil pan had been knocked almost completely loose, hanging by a grommet. Also, one of my fog lights had been pushed in about an inch, but was still functional. I made emergency repairs, ate at Truett’s (Chick fil-A’s fancier sibling), and pushed onward. After checking into the hotel, I decided to take a walk. I got as far as a burned-out bus, guarded by two policemen. My anticipation grew. Only my fatigue from the six-hour drive enabled me to sleep that night.